The Rainbow Trust is working with other Charities and non-profit organisations to provide the benefits of State-of-Art equipment for diagnosis and treatment of UK patients. State-of-the-Art equipment is enabling better healthcare through advanced 3D and Real-time imaging which allows the body and any problem with it, to be viewed as it is from any angle and in colour, enabling easier assessment and treatment of problems. 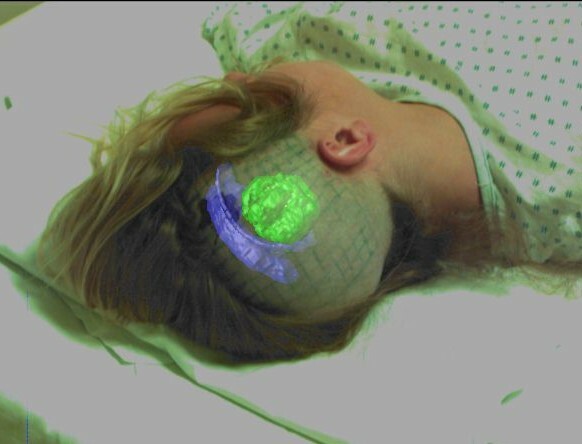 Some of the many advantages of 3D and Real-time colour imaging is the exact location and extent of problems can be shown on screen in theatre which in the case of many cancerous growths enables complete removal. (Without complete removal, remaining cancerous cells can spread to other parts of the body and then a person can get cancer throughout their body). 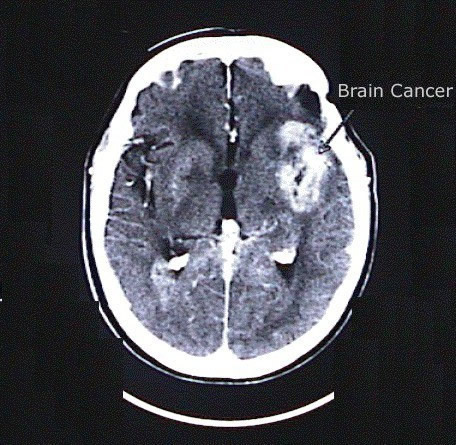 Below is a 3D Real-time colour image of a Brain Cancer (shown in green) provided in theatre for surgical removal Below is greyscale image of a Brain Cancer (arrowed) taken on the most advanced UK equipment. As can be seen in the above, the greyscale image is very different from the real appearance. In the UK, this difference in appearance requires a radiologist to perform a major mental reconstruction of the greyscale image and following this, to write a report to a surgeon. The report requires any physician who reads it to mentally translate it back into visual imagery. Apart from such procedures being time consuming between diagnosis and treatment with 3D and Real-time colour imaging none of these procedures or mental imaging are necessary, as images of problems can be shown on screen in theatre and simultaneously in the radiologists reading room. So, the benefits of all expert knowledge can be implemented as images are viewed and the treatment undertaken. 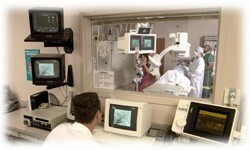 Importantly, 3D and Real-time imaging can be coupled with other systems, which allow breast, prostrate, bone, cervical, ovarian, uterine and other cancers, (and many other conditions) to be imaged and treated simultaneously without surgery, (provided in cases of a cancerous growth it is found early enough). As these technologies reduce morbidity and improve treatment and outcomes, our endeavor is to help any way possible any organisations dedicated to make this imaging broadly available. For more information of the benefits State-of-the-Art equipment and to see movies and other examples of the 3D and Real-time images it can provide, please click next at the end of this page to go to the Diagnosis For All website.